This research deals with the lives of freeters, irregular workers aged between 15-34 who are neither housewives nor students. Despite alternatives to working in ‘regular’ full-time employment, normative notions of Japanese masculinity continue to revolve around the responsible middle-class salaried worker, breadwinner, and father. Consequently, male freeters face more than just employment difficulties as their work status serves to say something about their very character. I argue that the negativity surrounding male freeters is not simply because they are not salarymen – indeed, the vast majority of men in Japan are not, and have never been, salarymen. I suggest that the issues surrounding freeters, whilst pertaining to masculinity, are intimately interconnected with ideas that male freeters are seen to not be embodying a socially sanctioned adult manhood. I propose that this notion of manhood intricately interweaves specific normative ideals of masculinity relating to achievements and particular character qualities, with cultural notions of what constitutes adulthood for men. 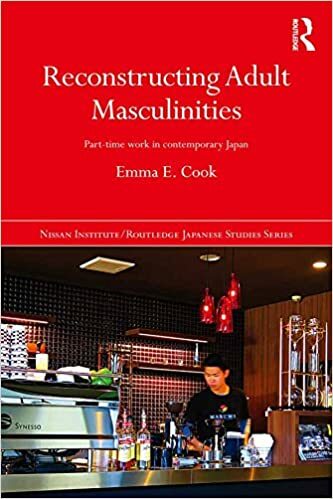 In 2016 I published a book based on six years of ethnographic research, titled: ‘Reconstructing Adult Masculinities: Part-time Work in Contemporary Japan’, London and New York: Routledge. In the book I take the lives of male freeters as a lens to examine contemporary notions of masculinity and adulthood, querying how notions of adulthood and masculinity are interwoven and how these ideals are changing in the face of large-scale employment shifts. At the same time, I ask: in today’s Japan, can (and do) male freeters become ‘proper’ adult men?